Well well well! I was off to gym and got a call from home that we had something awesome waiting for me that came by via mail. I was so excited that I cut short my workout session and came back home. 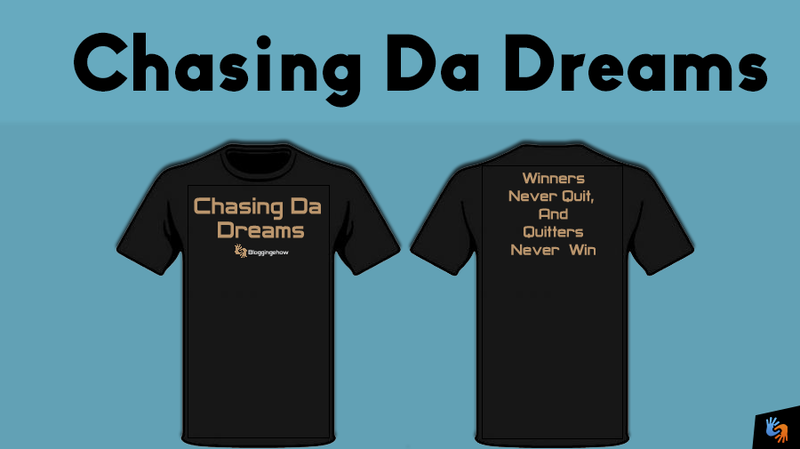 Here we have the first ever BloggingeHow apparel (T-Shirt) which I believe represents the entire journey of mine and resonates the mantra of the people who see success in no matter what they do! Below is a short video that I shot the moment I stepped into the home. Currently this shirt isn't launched yet and I look forward to launch it in in near future InshaAllah. Though if you're looking forward to pre-order this, you can drop your email and name on BloggingeHow Apparel page and I'll notify you when this gets live! This is NOT just a Shirt! It's what we are and sums up my 4 years of blogging. Notify Me When This Launches! Once you leave your email for notification on this page, you'll be taken to the 'thank you' page where I go through the design aspect of this shirt and what made me come up with this design. Since I started my online journey, I had my ups and downs. In my downs, I learned to NEVER GIVE UP, and there always comes a bright fresh shiny day after every night. And trust me, good days always come! You just have to be strong and stay committed to your dreams. This skin/tshirt represents the true BloggingeHow Ideology. An Ideology of a winning mind! It's not that you always win, BUT if the mind says you can, YOU WILL! It's not just about blogging, it's about winning at everything you do in life. If you're a student, you chase your goal is to study in your dream university. If you're a bodybuilder, your goal is to bring forward the best you can in terms of physique. If you're entrepreneur, you look forward to build up your own empire from scratch. NO MATTER what you do, it's about 'chasing da dreams' every single morning when you wake up. This shirt will be a source of motivation and a reminder every single moment of your day, that you're working to chase your dreams. So it's up to you to choose from. Are you a WINNER or a QUITER? Because, winners NEVER quit, and quitters NEVER win! Stay blessed guys. And make sure you give me your emails and names via this page so that I can let you know when this gets launched InshaAllah! BloggingeHow wouldn't have been hear because of you guys and I can't say it enough!